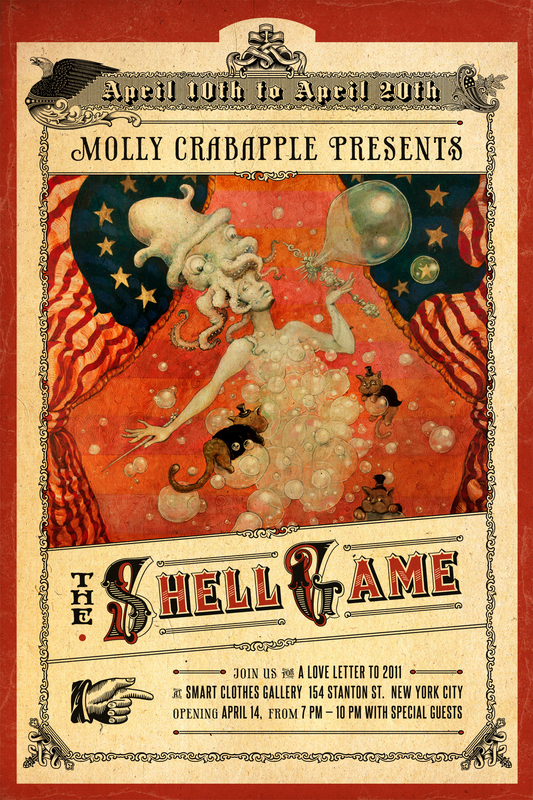 Shell Game opens Sunday, April 14th! The paintings have been moved into the space & Shell Game is almost ready to be unveiled! Please join me on Sunday, April 14th for the public opening at Smart Clothes Gallery in Manhattan from 7-10pm. All 9 finished paintings, 9 watercolours and the Wheel of Fortune will be on display, thanks to the funding of 701 amazing and wonderful Kickstarter backers. The opening will also feature free hard cider and beer from Original Sin and Brooklyn Brewery! Thanks to our sponsors, Blick Art Materials, Original Sin Hard Cider, Brooklyn Brewery, and Bombay Sapphire! This entry was posted in Uncategorized on April 8, 2013 by Molly.